Mammoth is hard to get to for us, requiring a 6+ hour drive, and we have to drive PAST Kirkwood and other Tahoe resorts to get there. Our first visit was in mid February 2008 when we met our friends Ryan and LeeWhay there for LeeWhay’s birthday. I remember sitting in the car near Kirkwood on the top of the pass waiting for Caltrans to complete avalanche control on the Carson Spur because Kirkwood had just received 18-inches of fresh snow that we were passing up. 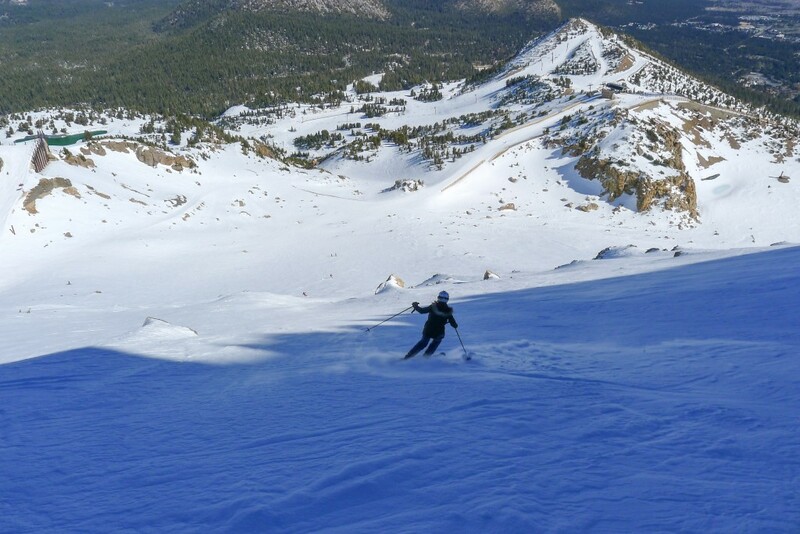 Still, if you live in California you will probably end up skiing Mammoth at one time or another. We had planned to ski 2 days at Mammoth on our first trip, but the second day a big storm was predicted so we made the most of the first day just in case. Good thing we did because that night it snowed over 36″ and it took us hours just to get out of the parking lot where our condo was. Skiing wasn’t even an option because getting around town was impossible. All we could do is hit the road to go home, which took us 12-hours. We had to go the long way around the Sierras to the south because 395 North from Mammoth Lakes was closed. So yes, there is such a thing as too much snow, and that was one of a handful of times we have experienced such a thing in the Sierras. The first day was fun, but it was quite windy so we never did get to ski the upper mountain on that trip. The snow on the lower mountain was superb though, and by late in the afternoon about 4-6″ had already accumulated and it turned into a late powder day. I (Ron) had previously skied Mammoth as a child back in 1972 or 1973 when my family lived in the Los Angeles area. 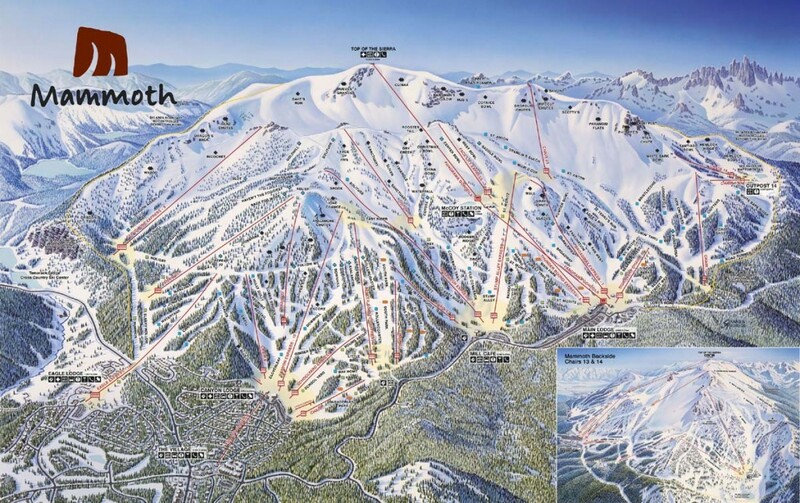 The fact that Mammoth is the closest major ski resort to the L.A. market makes for some big lift lines and crowds, but it is a big mountain and there are plenty of places to find yourself a piece of real estate to stretch your legs on. Ryan and LeeWhay ski there all the time and swear that the crowds aren’t any worse than what we see in Tahoe. We were lucky to have our friends showing us around, because it’s a wide-open mountain on the top and west side, with a lot of runs that can get pretty confusing without defined slots through trees. Our second trip in February 2015 was a completely different experience. That year was a VERY poor snow year, with only about 100-inches falling that season before our visit. It was definitely low-tide with about 1/3 of the trails closed and icy conditions. It had rained and frozen, so the only skiable stuff was either groomed or in the last 700′ of vertical at the top. 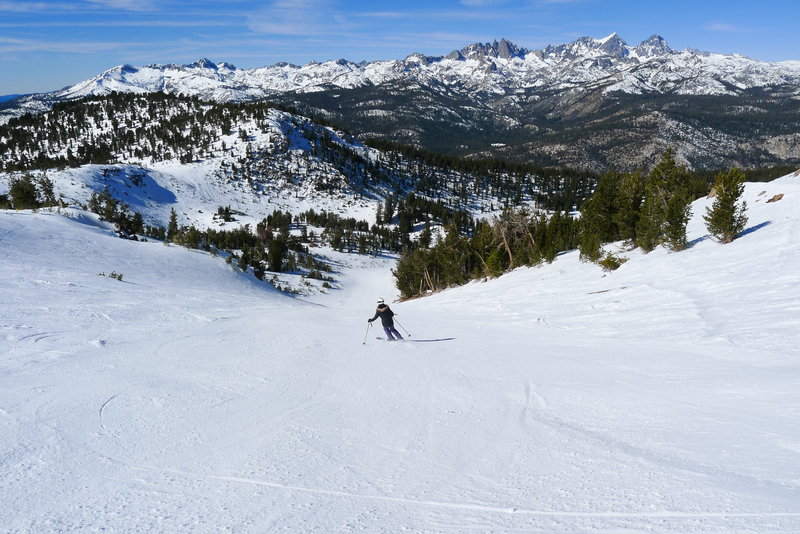 On the second trip we got to ski the western side of the mountain which is less crowded and has great views of the Sierra Crest to the west, as well as the very top, which is the highest lift-served skiing in California. Our third trip in 2016 featured high winds and most of the mountain shut down for 2 days. Boo! This was ALMOST the final nail in the coffin for us at Mammoth, but we returned in July 2017 to combine camping with skiing and had a great time. Most of the mountain from Main Lodge up was open and the snow was much better than it had been in Tahoe. Yes, it was July but 2016/17 featured record snowfall for most of the Sierra and they stayed open until mid-August. The key to Mammoth for us seems to be to avoid storms because when it is storming it is crazy windy and not at all fun. We will probably ski there in the spring/summer from now on based on our multiple encounters with wind there. Wind and crowds are the 2 big negatives at Mammoth. The upper mountain closes frequently due to wind, which is also common at Heavenly. The mountain is confusing to navigate even on a clear day, with lots of intersecting trails and cross-traffic. The very top of the mountain has the best terrain and runs, but the only way to get there is on chair 23 or the Gondola. Most people take the Gondola but load at the mid-station. That means taking your skis off for every run and walking. Chair 23 is the only other access to the top other than the gondola, and doesn’t access the best runs, but would be our go-to chair if it had safety bars. It’s spooky even for us who have ridden hundreds (probably over 1,000) of different lifts around the world. How hard would it be to add bars? Kirkwood did it on Chair 10 which is very similar, and that went over well. On our first trip there, late in the day we were doing laps under the Broadway chair in a blizzard and the snow was super soft and fun. On the second, the run down Climax off the top under the gondola was great with some of the only non-icy snow we found on the mountain. Also on our second trip, we met some great people who invited us to their bbq at the Stump Alley ski beach. We were parked there and spent a couple of hours after skiing hanging out. 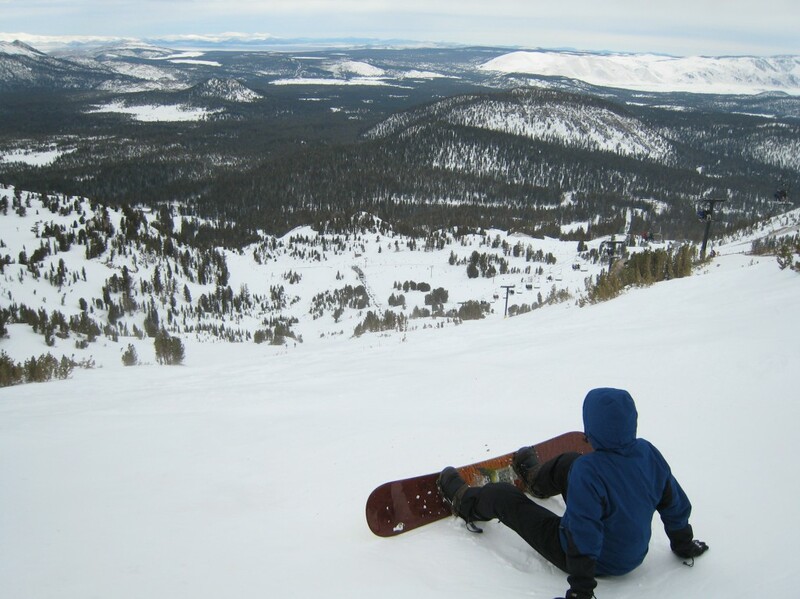 We are not especially fond of Mammoth due to crowds, weather, and the way the terrain is layed out, but we would go back to Mammoth Lakes to ski one day at June Mountain, and one at Mammoth. Hopefully it’s a weekday when the crowds are a little less.